Here in southern Mississippi, the hot summer weather had already taken over and the watermelon patches are already producing big, bright watermelons! Enjoying a slice of cold watermelon is one of my favorite things in the summertime, so I fell in love with this party theme. 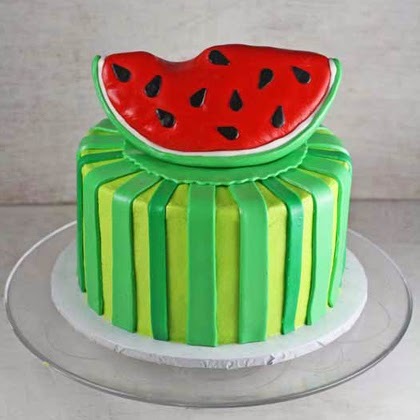 For the cake, I was asked to include the stripes of watermelon and also a bitten slice on top. Isn’t that fun? Because of the shape of a slice of watermelon, I knew doing it from cake would be difficult, so I opted to make it with rice cereal treats. I took pics as I made it and today I want to show you how I made the slice of watermelon cake topper!